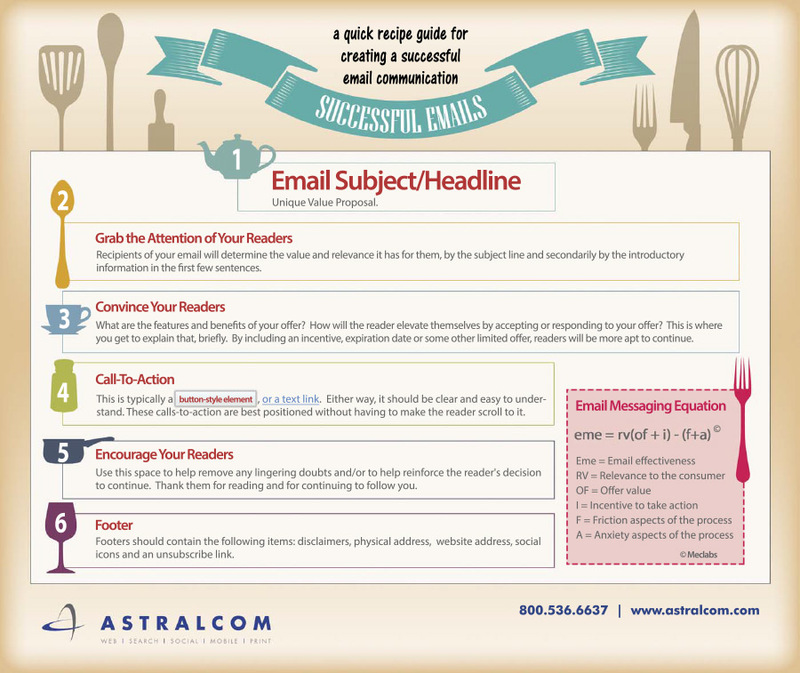 How to Create a Successful Email Message | ASTRALCOM - Content Strategy, Conversion Marketing and Customer Acquisition. Of all the channels to spend your time optimizing, email is one of the best. Email provides the single most direct line of communication for conversion to sales. With an ROI of approximately 4,300% (according to the Direct Marketing Association), it’s also quite cost effective – virtually paying for itself. With proper relevance, cadence and frequency, email marketing can increase engagement with buyers and helps to shorten sales cycles. In our last “How To” post, we laid out How to Create a Successful Conversion Page. We use the same philosophy in creating a successful email message. Though, with email specifically, there is a different heuristic to employ. Now, we don’t just make this stuff up. This heuristic was introduced to us by Meclabs and it works. So if you’re not getting open rates above 30%, or if your click-through rates are below 10%, try implementing this method and see the difference. Try the heuristic above and let us know how it works for you!